In the early morning hours on this date in 1939 the first of two back-to-back seismic changes to Europe’s polit­i­cal, eco­no­mic, and geo­strategic equi­lib­ria occurred with the signing of the German-Soviet Trade and Credit Agree­ment in Berlin. An out­growth of months­long econo­mic and polit­i­cal talks between German and Soviet repre­sen­ta­tives bent on improving bi­lateral rela­tions, the econo­mic deal between the two long-term ideo­logical rivals was the essen­tial pre­lude to a second agree­ment, the 10‑year German-Soviet Non­ag­gres­sion Pact with its secret proto­col for dis­mem­bering Poland, sealed days later in Moscow’s Kremlin. The August economic agreement was crafted to give Nazi Germany access to the Soviet Union’s agri­cul­tural pro­ducts, metal ores, rubber, and oil, of which the former coun­try was an habit­ual net importer—e.g., importing 20 per­cent of its food­stuffs, 60 per­cent of its iron ore, 100 per­cent of its chrome and man­ga­nese, 80 per­cent of its rubber needs, and 66 per­cent of its oil by 1939. In return the Soviet Union, having embarked on its third Five-Year Plan in 1938, was to gain access to hard currency (a 7‑year credit line of 200 mil­lion German Reich­marks, roughly equi­va­lent to 69 mil­lion U.S. dollars), indus­trial equip­ment such as diesel engines and loco­motives, tech­no­log­i­cal know-how, man­u­fac­tured items like piston rings and spark plugs, and pre­cious mili­tary wares (war­ships, fighter and bomber air­craft, tanks, field artil­lery, gun sights, bombs, and ammu­ni­tion, for example) to strengthen its weakened defense forces as well as modernize its creaking indus­trial sector. The rap­proache­ment em­bodied by the twin pacts allowed Adolf Hitler, who now had a friendly frontier to his east, to loose his armed services on Poland, propelling Great Britain and France into World War II. The German-Soviet Trade and Credit Agree­ment initially dis­appointed its German supporters, who had advo­cated reju­ve­nating eco­no­mic coop­er­a­tion and trade between Berlin and Moscow in the face of an anti­ci­pated British mari­time block­ade of their coun­try. Over the six months that followed its signing, both sides engaged in occa­sional bad faith as they finessed, rein­ter­preted, amended, or refused to com­pro­mise over still-out­standing details; delayed agreed-on recip­ro­cal deliv­eries of raw mate­rials and finished goods; procras­ti­nated by throwing up reams of red tape; inflated prices; and provoked occas­ional spats that required the highest levels of polit­i­cal inter­vention. Revisions in February 1940 and January 1941 elimi­nated the most criti­cal defi­cien­cies in previous treaties and upped the value of their bi­lat­eral exchange by hundreds of millions of Reichmarks (RM). By mid-1941 the Germans had tapped into the Soviet Union’s vast natural resources for a year and a half, while their trading part­ner was the recip­i­ent of val­u­able manu­factured goods and services. By way of example, on the German side between February 1940 and June 1941, that worked out to 900,000 tons of oil, 660,000 tons of metal ores (e.g., man­ga­nese, chrome, and iron), 18,000 tons of rubber, 200,000 tons of cotton, and 1.6 billion RM in grains (20 per­cent of the amount of the total German har­vest). At its high point in 1940, the com­bined value of trade is esti­mated at 646 mil­lion RM (about $258 million), with the Soviets selling 404 mil­lion RM of com­mod­i­ties to Germany and Germany delivering 242 mil­lion RM worth of goods to the Soviet Union. The short-lived age of German-Soviet détente and coop­era­tion ended in the ear-splitting sound of rolling thunder as Hitler’s legions of air­craft, tanks, artil­lery shells, and over three million battle-hardened men poured over the Soviet frontier on June 22, 1941. 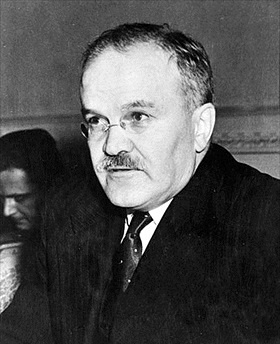 Left: Soviet People’s Commissar of Foreign Affairs Vyacheslav Molotov wrote in Pravda, the offi­cial mouth­piece of the Soviet Com­munist Party, that August’s com­mer­cial agree­ment was “better than all earlier treaties” and “we have never managed to reach such a favor­able eco­no­mic agree­ment with Britain, France, or any other coun­try.” Early in the morning of August 24, Molotov and his German counter­part, Foreign Minister Joachim von Ribben­trop, signed the poli­tical and mili­tary treaty, the Molotov–Ribben­trop Non­ag­gres­sion Pact that was the com­pan­ion piece to the earlier com­mer­cial deal. (The second treaty bears the date August 23, 1939.) In effect a neu­trality agree­ment between the two countries, the Molotov–Ribben­trop treaty con­tained a secret proto­col for dividing the states of Northern and Eastern Europe into German and Soviet “spheres of influence.” Inter­estingly, Soviet dicta­tor Joseph Stalin con­sidered the trade deal at the time to be the more impor­tant of the two Nazi-Soviet pacts, for it had the poten­tial to return bi­lateral trade to levels last seen in the 1920s and early ’30s. Hitler placed his bet on the follow-up non­ag­gres­sion pact, waiting just long enough for the ink to dry before ordering his attack on Poland on September 1, 1939, and plunging all Europe into World War II. 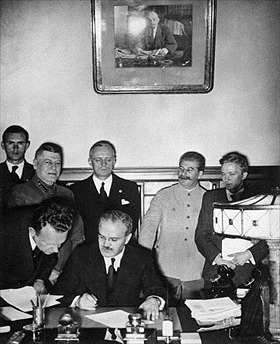 Right: Soviet Foreign Minister Molotov signs the German-Soviet Treaty of Friend­ship, Coop­er­a­tion, and Demar­ca­tion in Moscow on Septem­ber 28, 1939, in the presence of Stalin (light tunic) and a framed portrait of Vladimir Lenin, Soviet first head of state. Standing to the right of Stalin is Molotov’s oppo­site number, German Foreign Minister von Ribbentrop, who signed for Germany. The Septem­ber treaty supple­mented the ini­tial secret proto­col in the Molotov–Ribben­trop Non­ag­gres­sion Pact signed the month before between the two coun­tries prior to their joint inva­sion and occu­pa­tion of their mutual neigh­bor Poland and the start of World War II in Europe.